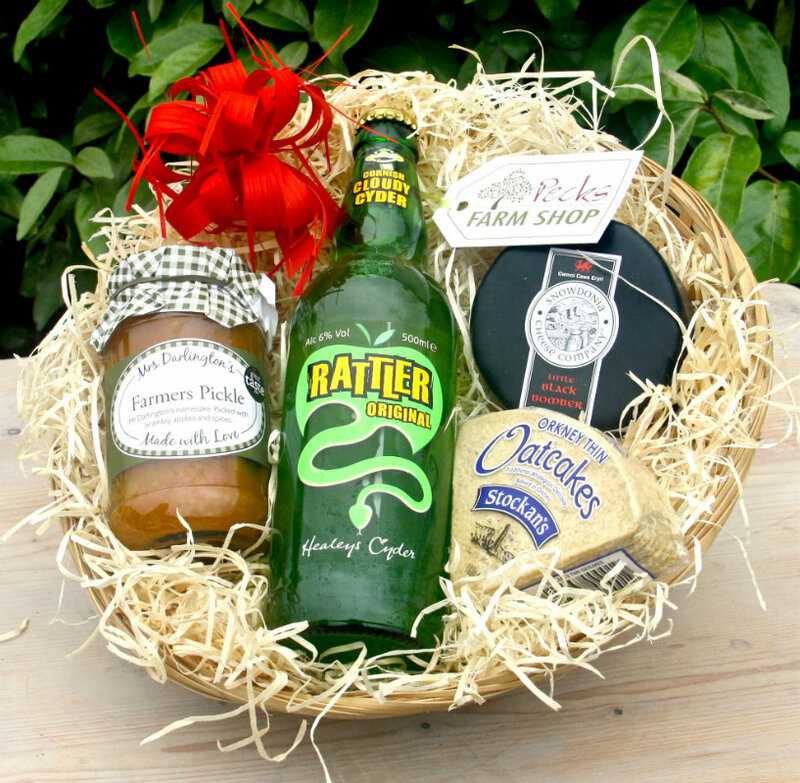 Our popular Ploughmans Christmas Hamper is beautifully presented in a wicker tray. Made to order it includes a bottle of beer (cider also available), a lovely hunk of cheese, a jar of pickle and a pack of cheese biscuits and an attractive handwritten greeting tag. Perfect festive foodie treat for any man. 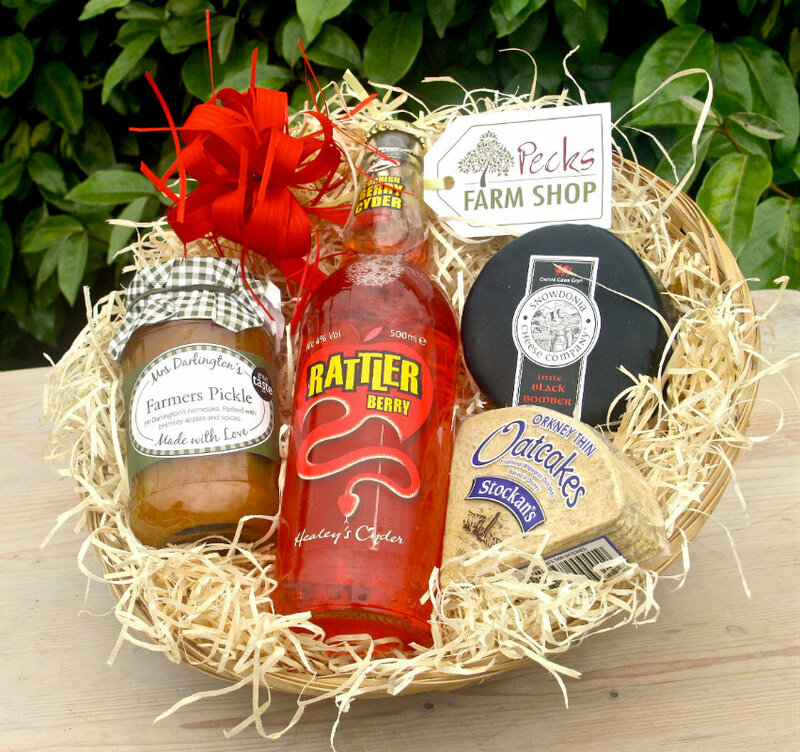 Our popular Ploughmans Christmas Hamper is beautifully presented in a wicker tray. It includes a bottle of beer, a lovely hunk of cheese, a jar of pickle and a pack of cheese biscuits. It makes the perfect gift for men especially for Christmas. This Ploughmans Christmas Hamper is hand crafted at Pecks, a family run, independent farm shop between Milton Keynes and Leighton Buzzard in rural Bedfordshire. It is carefully packed to arrive in perfect condition. In addition, we include an attractive handwritten greeting tag. 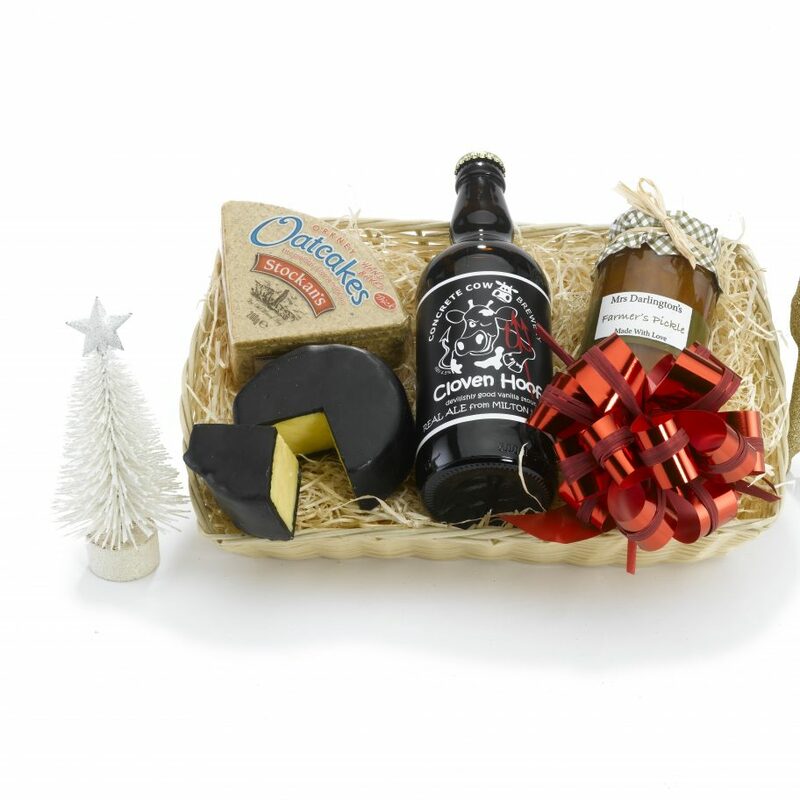 This Ploughmans Christmas Hamper is the perfect gentleman’s foodie treat food festive gift. Beautifully presented in a flat wicker tray, it contains a selection of the finest British food products sourced from speciality, local producers who care as much as we do about good food. When ordering you can specify a delivery date, if you do not specify a date then we will deliver in 2 working days. If you wish to deliver hampers to multiple addresses please call us to process your order. Do note that the deadline for delivered festive hampers is the 11 December 2017. Please note if we are out of stock on an item, we will substitute it for an item of a similar product of equal or greater value (you will only be charged the lower price). If you do not wish to have a substitute please say in the ‘Additional Information’ box when ordering. For more information call us on 01525 210 281 or contact us.